Card of the Week – Slug It Out! Lord Slug has arrived, and his quest for eternal youth translates to Powers that acquire Dragon Balls and rapidly change levels. Check out the final MP from The Movie Collection, which launches July 3rd! Lord Slug – Aged has a wide variety of applications. In Namekian, laying out Dragon Balls will allow you to quickly level (even outside of combat!). 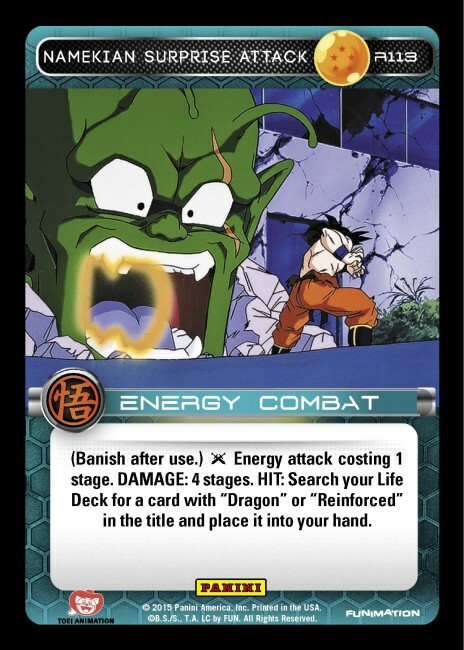 A control deck can benefit from searching out Namek Dragon Ball 6, while something more offensive might grab Namek Dragon Ball 1. At Level 2, Slug maintains an impressive AT range while gaining a strong physical attack. On Lord Slug – Renewed, you’ll have to plan ahead to maximize value. 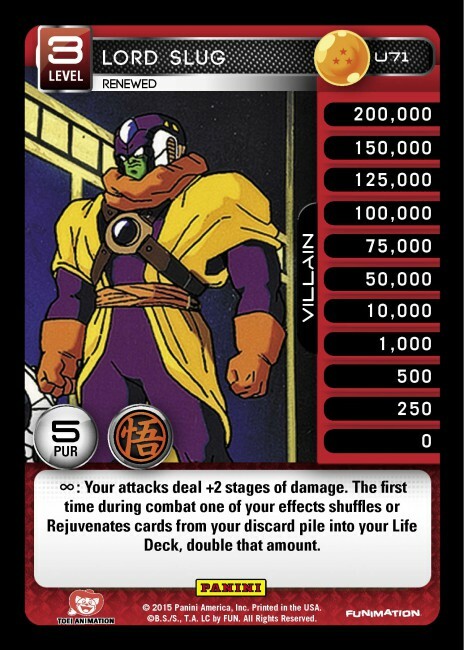 His ability to double a regeneration effect has obvious applications in Namekian, but Slug’s Named cards allow other Styles to consistently Rejuvenate. At the same time, Slug keeps up offensive pressure with a +2 modifier to all of your attacks. 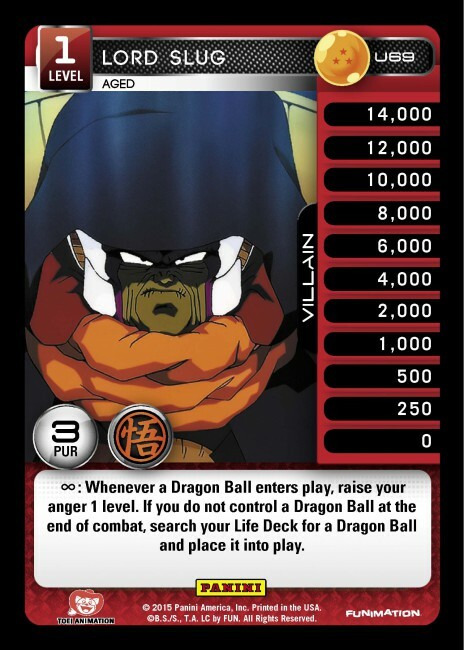 Level 4 gives up the ability to win by MPPV in exchange for an extremely versatile and advantageous Power. You can control the board by searching out Namek Dragon Ball 4, even nuking a Visiting the Past before it has a chance to be used! 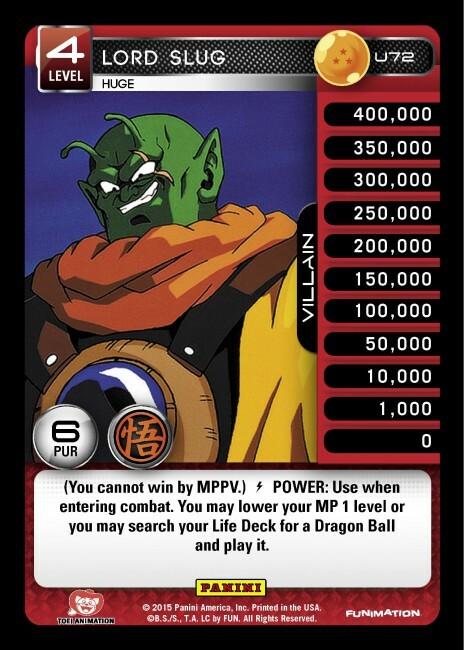 Against MPPV, Namek Dragon Ball 2 is available as needed. 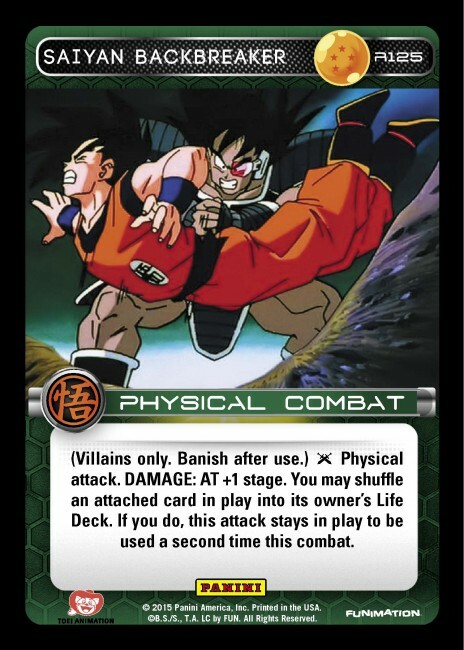 You can swing the Life Deck race with Namek Dragon Ball 7, or protect something key by pulling Namek Dragon Ball 1. If you have the luxury of entering multiple combats in the late game, you can quickly achieve Dragon Ball victory. If you need to play defensively, Slug can always drop back down to Level 3 to begin refilling your deck! Lord Slug’s Fist Slam augments his overall flexibility. Early on it will help you reach your powerful Constant Powers, which interact positively with the secondary Capture/Rejuvenation effect. Lord Slug’s Regeneration is uniquely powerful, as it is the only auto-level effect that also allows you to drop back down. This will net you a card with Red Empowered Mastery, and note that any use on Level 2 or Level 4 sets up the possibility of Rejuvenating eight cards! 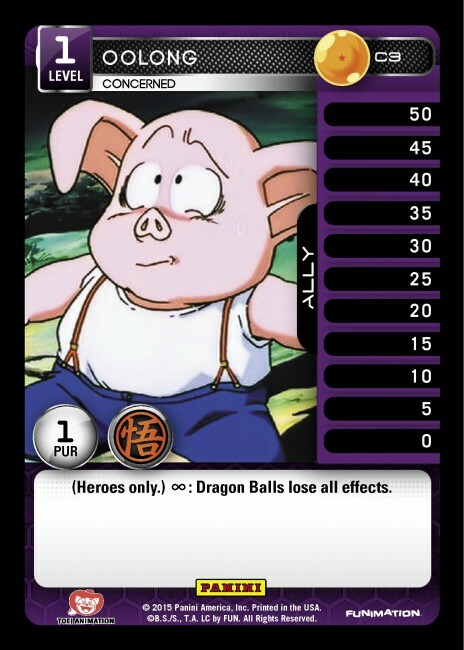 Oolong puts a dent into any Namekian deck, and any builds relying on repeated uses of Namek Dragon Ball 7 will need to be prepared for the shapeshifting pig. Saiyan Backbreaker consistently provides two attacks, as you’ll almost always be able to remove something pesky (ex. Wall Breaker), something useful for your opponent (ex. 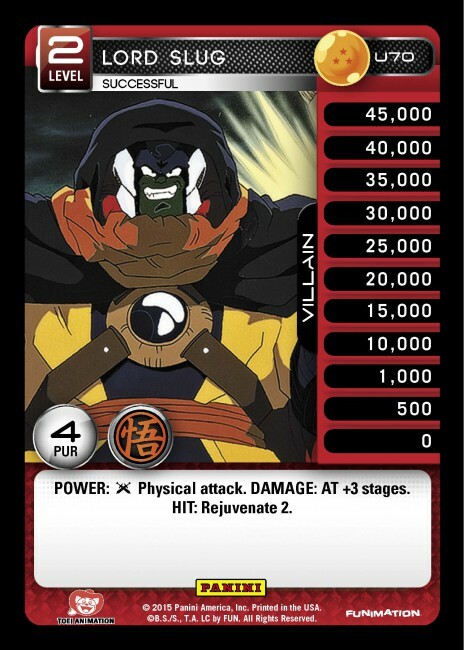 Raditz’s Offensive Guard), or something of your own (ex. Saiyan Rescue, allowing another copy to be used!). 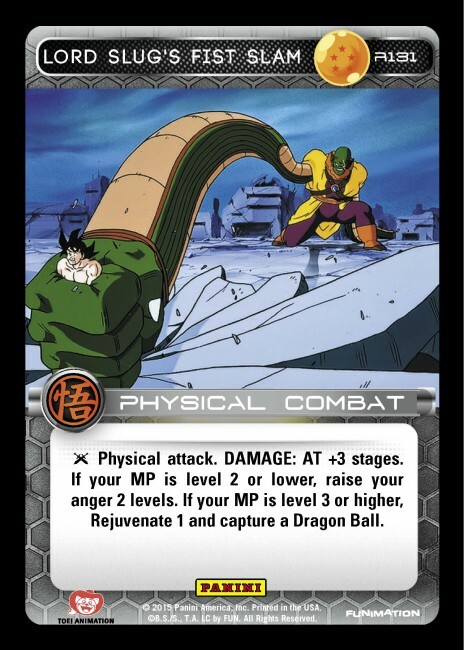 Namekian Surprise Attack glues together the Reinforced package of cards, and it can search out a Dragon Ball for various pitch effects. Blue Barrier further expands Blue’s counter-play options, providing a strong answer to Overpowering Attack or Captain Ginyu. 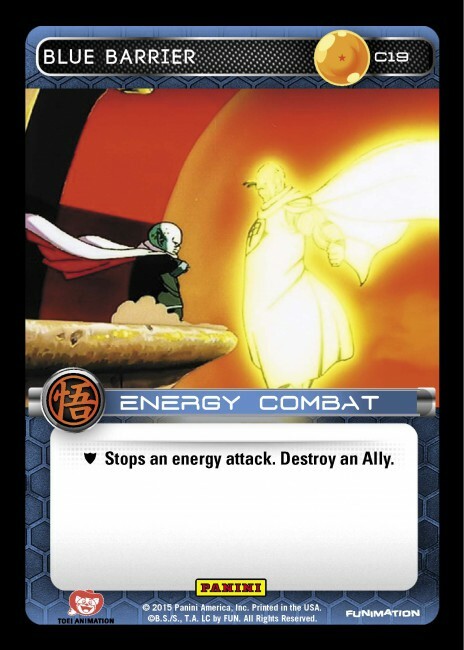 Card of the Week – Foil Pattern and Final Previews! Namekian Surprise Attack sounded really lame at first. Then I realized it can nab Dragon Balls. Another fun looking MP. Good job with Set 3 guys (and we still haven’t even finished spoilers). Slug looks like a ton of fun to play. I can’t wait! Props to Panini for putting together such great-looking MPs for set three! I can’t imagine myself not wanting to build a deck for all of them at some point. 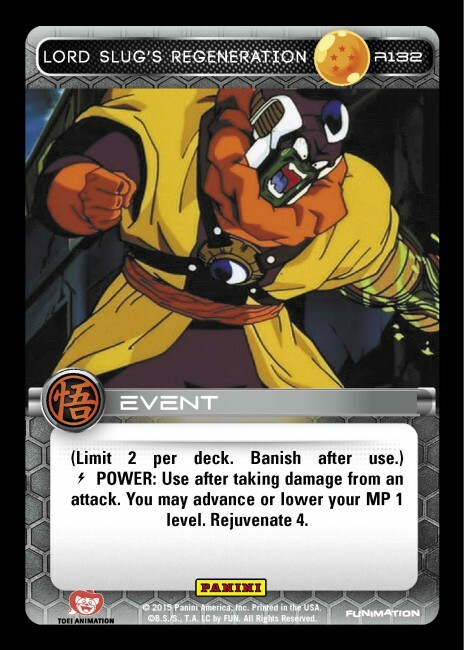 That being said, I really hope there’s at least one hero MP in the set; perhaps Kami? Either way, July 3rd can’t come soon enough. Wow! I couldn’t wait to play Slug so I proxied him, that level 4 is broken. In the games I got to use it, being able to fetch a DB when entering and PLAY it was amazing. Reused namek 3 three combats in a row thanks to double strike shuffling it back in. Being able to reuse namek 7 or namek 2 over and over would be really good too. Really exceeded my expectations with this personality set. Now if only we could get spheres down to something reasonable price wise.